I love all of the flasks in this background paper! I unpacked almost all of my kitchen last night, and placed things in the new cabinets. A few of the cabinets changed size (or configuration)…not sure if I like how I have things this first iteration. Luckily, I can always try again! Supplies: Stamps – My Favorite Things, Taylored Expressions, paper – Doodlebug Designs Boos & Brews, Neenah Classic Crest Solar White, Stampin’ Up! Tempting Turquoise, inks – Copics B0000, B02, YG06, VersaFine Onyx Black, dies – My Favorite Things (pierced rectangle), Spellbinders (rectangle), embossing powders – Filigree Fine Art Powder clear, Ranger Silver Pearl. Categories: card, caring, thinking of you | Tags: card, Copics, Doodlebug Design Inc, My Favorite Things, Neenah, Spellbinders, Stampin' Up!, Taylored Expressions, Tsukineko, VersaFine | Permalink. Is this available with another sentiment? I it doesn’t have to be as perfect as this one. I’d like to give it to my husband just because I love him. I will e-mail some options, Terry! I love the background paper! One of my favourite collections! 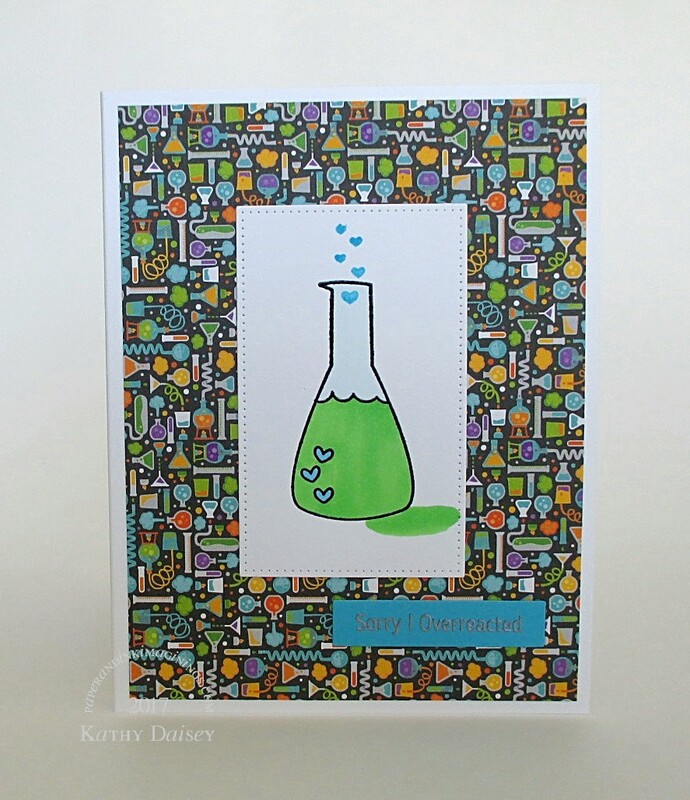 Yes, that Doodlebug collection is great! Ah, great science-based fun! Love it, Kathy! Enjoy the kitchen! I really do love the science puns! And the kitchen – cabinet contents might get rearranged. Funny, new cabinet interior dimensions are less than original cabinet interior dimensions. I’ll have to keep working on it.